The appearance of Varicose veins can make people feel self-conscious about their bodies, especially during the summer, leg baring months. Varicose veins can draw unwanted attention because they stand out with their blue or purple color and often bulge from the surface of the skin. Their bulging appearance is usually larger in diameter than a pencil and look like ropes underneath the surface of your skin. When these veins become swollen or enlarged, some people with experience discomfort and pain in the area of the Varicose Vein. The main function of veins is to return blood from the rest of your body back to your heart to recirculate. Though, when the blood returns to your heart, your veins have to work harder as they working against gravity. Valves, or openings, within the veins allow the blood to circulate through. However, when those valves begin to weaken the backwards flow of blood, back to the heart is stopped (in the effected vein) while the damaged vein collects that uncirculated blood. This process explains why your veins appear as highly visible, swollen, wavy, pathways on your skin. Well that is subjective. 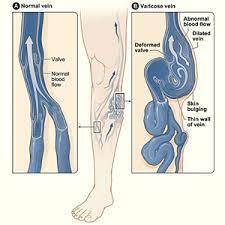 While they are twice as likely to be found in women, if you are male, you may still suffer from Varicose Veins. This is a common condition and is hereditary for some individuals. If you have signs of varicose veins, there’s a large chance your mother had them as well. Around 25% of the Caucasian population is projected to have the occurrence of varicose veins. This rate is greater with female hormones and age. 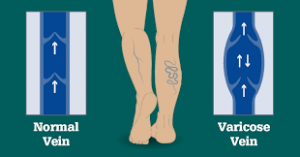 Besides being a cosmetic dilemma, there are uncomfortable symptoms of varicose veins. Some of these symptoms can include, a throbbing sensation in the area of the vein, legs feeling heavy or sore, cramping of muscles at night, swollen feet, and itchy skin on infected area. These unwelcome side effects may worsen by the end of the day, especially if you have a job or lifestyle that consist of standing much of the day. When you suffer from the appearance of varicose veins, though do not have any of the painful side effects, there are still emotional effects to these little nuisances. They often cause people to be reluctant to wear what they want to wear, such as shorts to work out or a swimsuit to the beach. Knowing they are there can cause stress and anxiety when you go out in public or attend outdoor functions during the summer. If you suffer from varicose veins and want more information, or are interested in treatment from an experienced vein doctor, contact us today to schedule an appointment with Dr. Norman Chideckel.